I should say at the outset that I’m acquainted with C.L. Wilson. We see each other at conferences or conventions from time to time. I wouldn’t say we know each other well, and I wouldn’t have agreed to review this book if I hadn’t felt certain I could be objective. The Winter King introduces readers to a new and complex world, Mystral. The hero, Wynter Atrialan, is king of a country called the Craig and has an affinity with wolves. 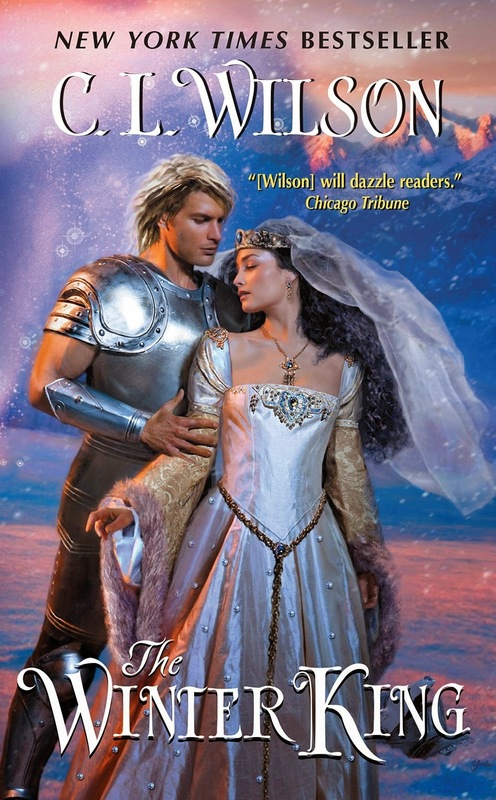 Because a prince of Summerlea, the neighboring kingdom to the South stole a priceless heirloom from Wynter and killed his brother and heir, Wynter has gone to war against Summerlea. To do so, he has taken on the dangerous ice magic of the goddess Wyrn. The power Wynter assumes is not without a price, but he successfully wields it to bring Summerlea to its knees. Part of the price of peace is the hand in marriage of one of the summer king’s daughters. Wynter believes there are three princesses of Summerlea. He doesn’t know about the fourth, Khamsin, who lives in obscurity because her father blames her for her mother’s death. The summer kingdom’s royalty possess weather gifts, and Khamsin’s allows her to rule the storm. Wynter and Khamsin have explosive chemistry from the moment they first make eye contact, both personally and in their respective gifts. But not everyone amomg Wynter’s people welcomes Khamsin, and her father isn’t through making trouble for Wynter. The political issues tie neatly into the personal ones. The nature of Wynter’s gift creates a ticking clock for the birth of an heir, and he and Khamsin must overcome quite a few obstacles, both personal and political, to make their marriage work. The conflicts are seeded in the characters and develop logically through the book. The secondary characters are well drawn, with several potential heroes and heroines established, including at least one who needs to redeem himself. Wilson handles the conflict with Khamsin’s family deftly and avoids having the characters overlook some truly abominable behavior and make everything rosy, instead of satisfying, at the end. The world has several different cultures and sources of magic. Readers who loved Wilson’s Tairen Soul series will not be disappointed in Mystral as a setting. If you enjoy hot, romance set in beautifully developed worlds and cultures other than our own, heroes and heroines who are brave and worthy but have demons to face down before they can be together, and a gripping story, you should try The Winter King. A former attorney who never outgrew her love of comic books, science fiction and fantasy, Nancy left the legal profession to pursue her dreams of creating her own action adventure stories. Nancy is hard at work writing WARRIOR, the next book in her Light Mage Wars series, contemporary romances set within a fantasy world in present-day Georgia. Quantum, I haven't tried the audio. I started reading C.L. Wilson Book 1, Lord of the Fading Lands, which a friend recommended. The books in that series are also substantial, and the major plot points take more than one book to resolve. If you like that kind of thing, I'd start there. If you want a book where the major plot is complete in one volume, I'd go with The Winter King. Love this type of read and just the cover alone would tempt me to pick it up! Catslady, isn't that cover gorgeous? I have this book on my TBR pile and I CANNOT WAIT TO READ IT!! I loved its goodies in the Goody Room at RWA...and I managed to score a book at a signing. MsHellion, I hope you enjoy it as much as I did! This sounds like it is an interesting and eventful book. Is this a stand alone book or a series? If a series, is there any indication of how many books there will be? Hi, librarypat--I think there will be at least one other book, but this one stands alone in that the plot threads are wrapped up here. The most up-to-date info will be on C.L. Wilson's website, www.clwilson.com.